Kathleen Mullin (MSE 4th year) was recently named the recipient of a National Institute of Standards and Technology (NIST) Summer Undergraduate Research Fellowship (SURF) for the second year. This accomplishment is extremely rare as the highly competitive program only awards around 100 fellowships each year. The program is co-sponsored by NIST and the National Science Foundation (NSF). For eleven weeks, Mullin will return to the NIST Material Measurement Laboratory in Gaithersburg, Maryland, and contribute to research projects under the guidance of NIST researchers, including three Nobel Laureates. She will be working on research associated with NIST’s Web Force‐Field Data Project. 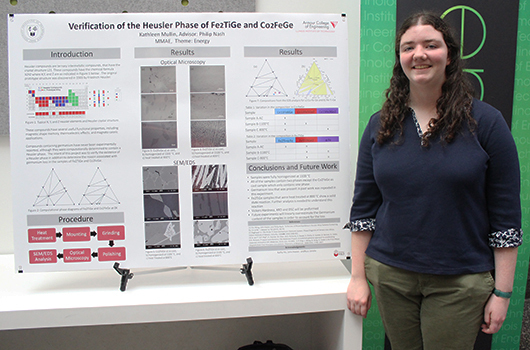 In addition to her research with the NIST, Mullin has participated in Armour College of Engineering’s undergraduate research program, Armour R&D. For two semesters she worked with Charles and Lee Finkl Professor of Metallurgical and Materials Engineering Philip Nash. The team worked on the project Verification of the Heusler Phases of Fe2TiGe and Co2FeGe in fall 2016 and continued in the spring of 2017 with the project Loss of Germanium in Fe2TiGe and Co2FeGe. When presenting her research findings at the Third Annual Armour R&D Expo, Mullin was awarded High Score Award for spring 2017.